I can hardly believe the day of departure has almost arrived. This has been planned and anticipated for over three years. My traveling companion for this escapade is Jared, College Sophomore and my son. We have booked planes, hotels and transportation for most of our trip but have left a little wiggle room for those off the beaten path excursions. 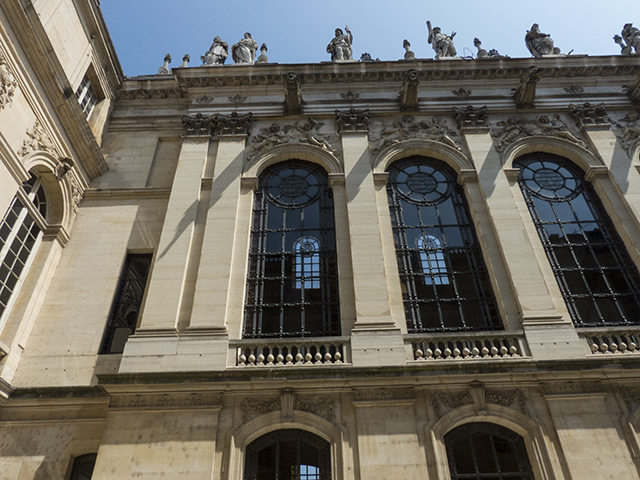 We will spend our first week in Paris, exploring its nooks and crannies as well as a few of the usual tourist attractions like the Eiffel Tower, Palace of Versailles, Notre Dame, Sacré-Cœur Basilica and a couple of Farmer’s markets. 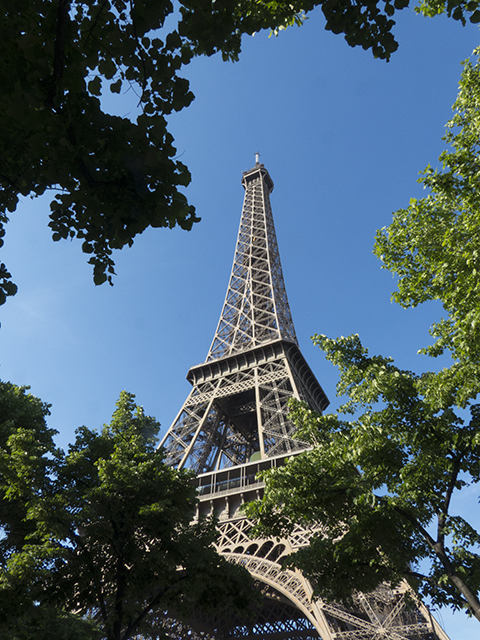 Our Paris leg also includes a trip to Mont St. Michael via high- speed train and an excursion to Claude Monet’s gardens at Giverny. From Paris we head to Lyon for a few days. 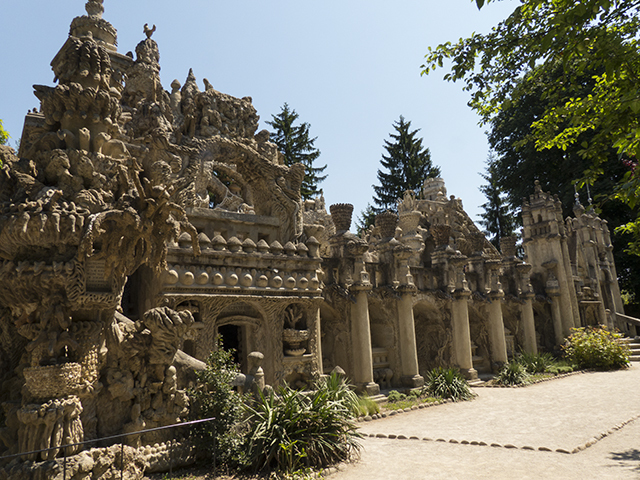 With Lyon as our base, a day trip is planned to an amazing castle called the Palais Idéal du Facteur Cheval in Hauterives and Maison d’Ampere, Musee de L’electicite (Electricity museum) in Poleymieux . 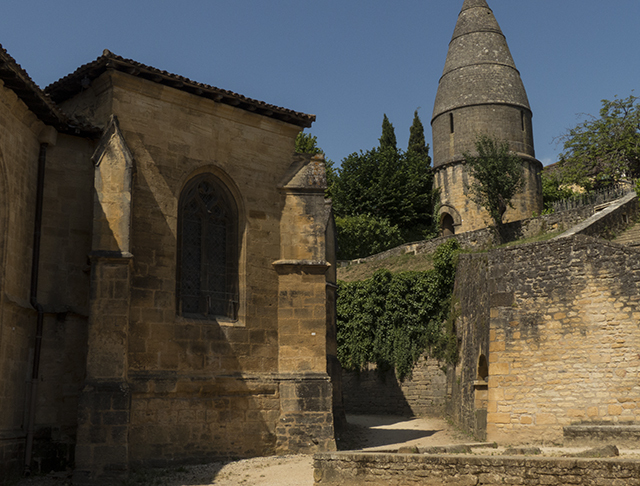 Next stop on our expedition, the Medieval town of Serlat-La-Caneda. 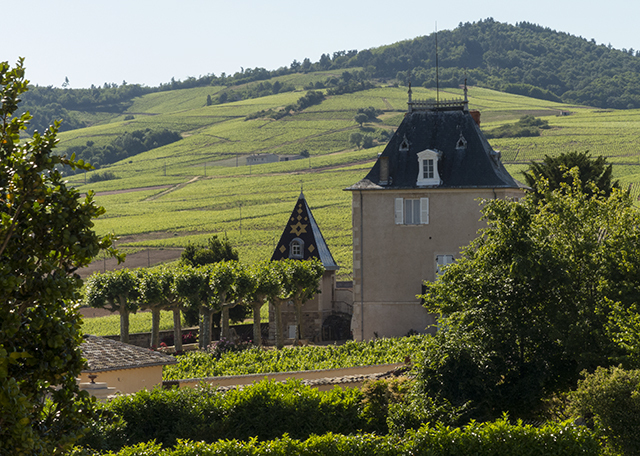 From there we’ll be visiting the prehistoric cave paintings at Grotte de Rouffignac and Laucaux as well as a winery or two. 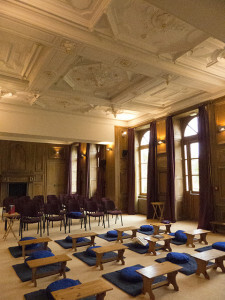 The last leg of our journey includes a stay at the Kadampa Meditaiton Center in Saint-Mard-d’Outillé then back to Paris before we leave to come home. I really hate flying out of JFK. The tolls are outrageous, the traffic annoying and the parking expensive. Unfortunately JFK provided the only fare within our budget. We arrived at the car park without a hitch, took the shuttle to the airport, only to find that every line inside the airport was exceedingly long. First came the check-in and then the extensive, twisting, security check queue. Two hours later, we finally boarded our, full to the brim, red eye flight. The flight was delayed by an hour and we were seated in the last row of our section. This unfortunate selection limited our ability to recline our seats for some much needed slumber since we would be arriving at 1pm in France. 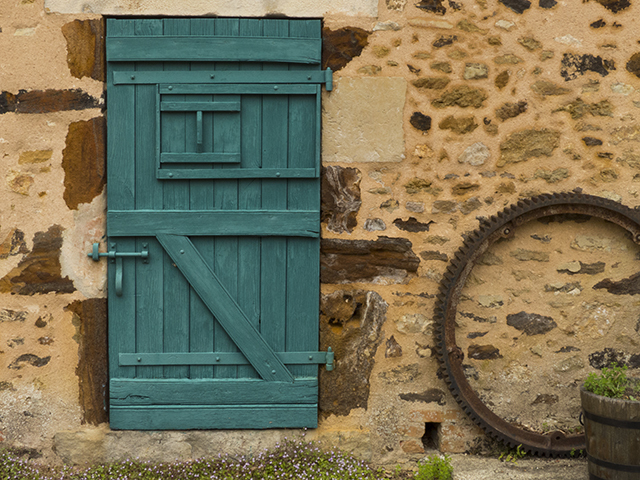 These accommodations made the flight seam like an infinite night of travel but after a sleepless seven hours we finally arrived at the Charles De Galle Airport in the outskirts of Paris. We swiftly realized, after exchanging our Dollars for Euros at an inflated rate, that we should have done it before we left home. Oh well, next time. The shuttle service to Paris, that we had online never arrived. After an exceedingly long hour of waiting and trying to struggle with their toll free number, we were finally told there was large accident on the highway leaving us to fend for a much pricier taxi. We were far too tired to care at that point and just wanted to get to our hotel as swiftly as possible. The driver apologized and told us that he would have to skirt the city, making our transfer to the hotel another slow and tedious process. We finally arrived at the hotel one hour and 70 euros poorer. The hotel chain we had selected was like a studio apartment, clean, efficient, and small, yet perfect for our needs. Maid service was weekly and we had a tiny kitchen in case we wanted to cook our own food. Not likely! We quickly freshened up from our long commute and made our way to the Métro and then on to the Eiffel tower. We decided to skip the queue for the view from the top in lei of people watching and some of the enticing street food that was all around us. The weather was warm and clear and we eagerly explored the area around our destination. We walked along the Seine and feasted on a couple of amazing savory crepes as we headed towards the Eiffel tower for some photo ops. It was much larger than expected, the steel frame looming gracefully into the sky. We had hoped to stay for sunset, but when we found out the sun wouldn’t set till 9:30, we opted to make our way back to the hotel for some much needed shut eye. We were now exhausted but thoroughly pleased with our first excursion. We had planned to get up early, but as our eyes very slowly opened, we realized it was already 10:30 am and not even close to an early start. We quickly dressed and headed out the door. Notre Dame was the first stop of the day on our tour of the City. 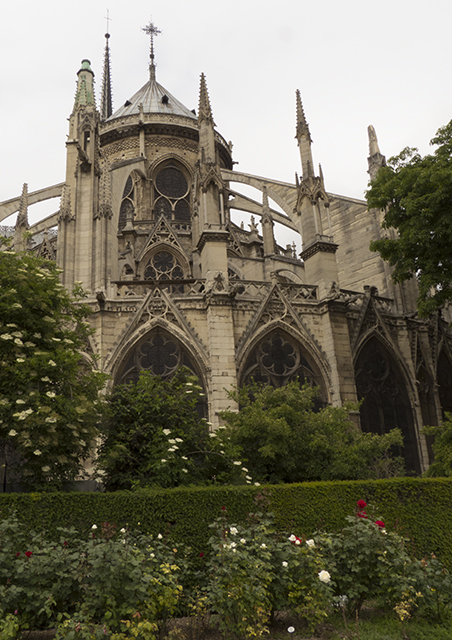 With its French Gothic architecture it is one of the most known buildings in the world. The lines were again too long to bother with the tour, I’m not into that part of the tourist scene, so we took a handful photos and ventured onward. 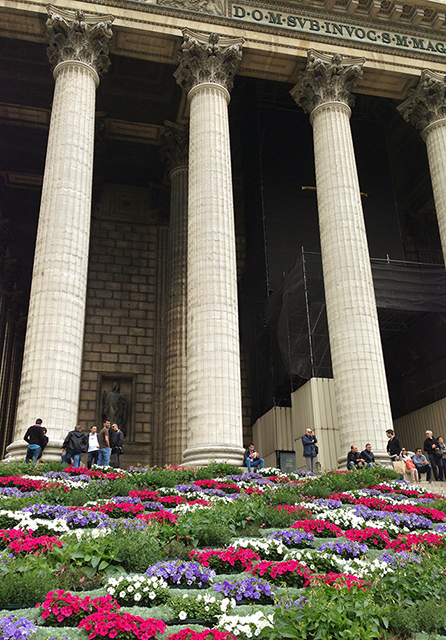 We continued the beginning of our very long and extensive walk in the direction of the Louvre. Again more lengthy lines, spoiled by the museums of NYC, we meandered around the courtyard and delighted in watching the other tourist. The compound was mammoth and you could easily spend a week exploring the 650,000 square feet of art and antiquity. I wouldn’t have known where to start even if I wanted to wait. Did I really need to see the Mona Lisa any way? 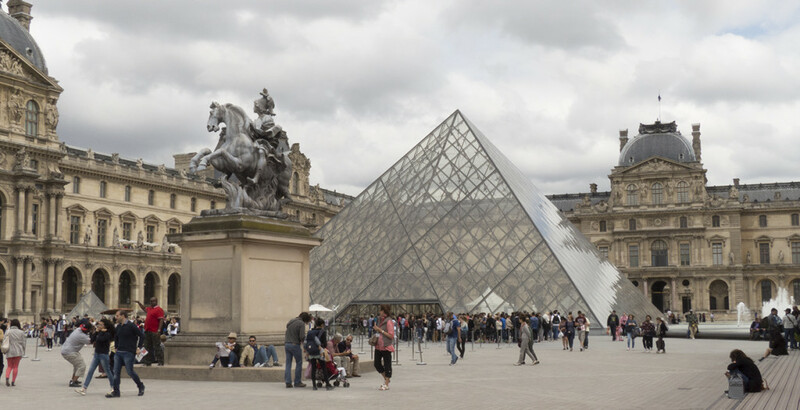 The iconic glass pyramid dominates the courtyard and sits in strong contrast against the stone, palace like architecture of the rest of the complex. People took turns standing on 2 ft. pillars pretending to hold the pyramid in their hands while their companions photographed the illusion. Jared wouldn’t entertain that idea so we moved on. After departing the courtyard, we resumed our stroll through the Jardin des Tuileries past the Obélisque and onward through the Jardins des Champs Élysées. Jardins means gardens, in case you wondered. The park finally opened up onto the L’avenue des Champs Élysées with its very prices stores and upscale tourist. Nice place for window-shopping and people watching but a $400 pair of shoes is not something I’m not really after. We walked and walked and walked till we finally reached the Arc de Triomphe. We had walked about 4 miles and were starting to feel the need for nourishment. 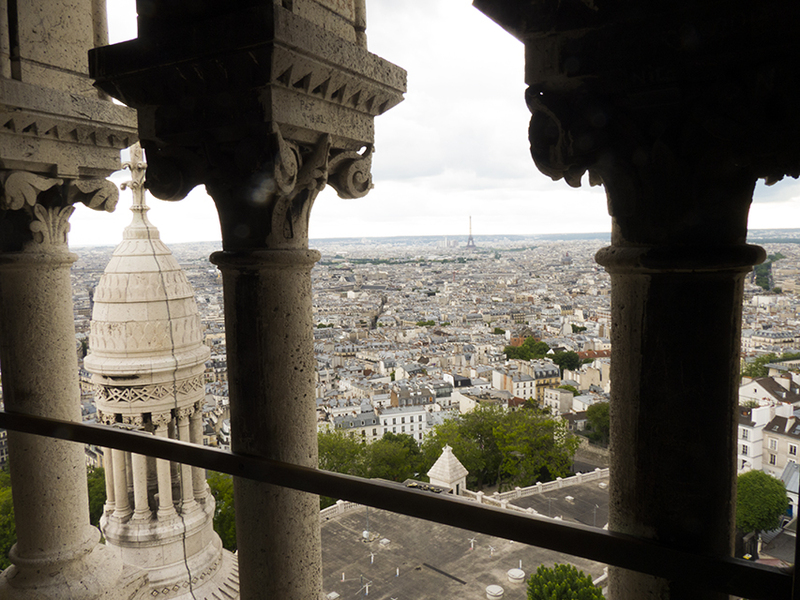 By now it was late afternoon so we decided to check out the view from the Sacré-Coeur Basilica. To the relief of my thankful feet, we took the Métro this time. Enough of the walking already, I told Jared no more 4-mile treks! The Sacré-Coeur Basilica, consecrated in 1919, is located at the top of the Butte Montmarte, and is the highest part of Paris. The streets leading from the Métro were narrow and twisting and felt like a Paris of old. Tiny shops selling meat, sandwiches, pastries, bread and cheese lined the cobble stone streets. We purchased a snack from a local sandwich shop. 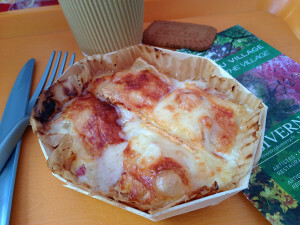 Jared got a baguette sandwich with ham, tomatoes and cheese and I got a piece of the finest quiche I had ever tasted. It was topped with slices of warm Brie and ripe tomatoes. 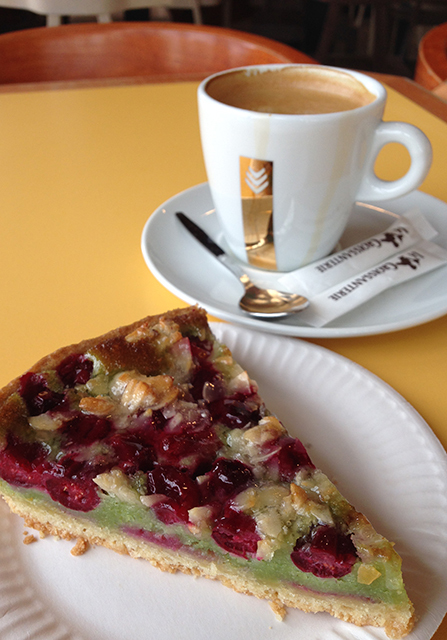 Both meals came with a cookie, that when we opened latter, found was more like a creamy, custard tart. Yummy! I love the food here. 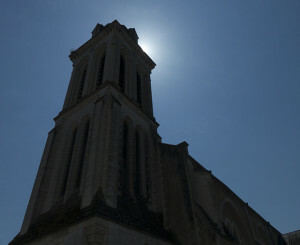 The view from the steps of the Basilica was panoramic. Inside we found an astonishing cathedral made of stone and glass. The enormous domed ceiling was decorated with the largest mosaic in France, measuring 1574 square feet. No pictures were allowed but to our delight, we found we could purchase a ticket to the top of the Church’s towering dome. They failed to mention the three hundred and twenty five steps up a spiral staircase, but in the end we were lead of to a 360-degree view that took our breath away. We headed back to our hotel, now very familiar with the Métro and slipped into bed dreaming of our adventures and looking forward to day 3. Be sure to check out the photo gallery as we add more pictures each day! We were feeling a little overwhelmed from the previous days events so opted for a later, this time intentional, start to our day. 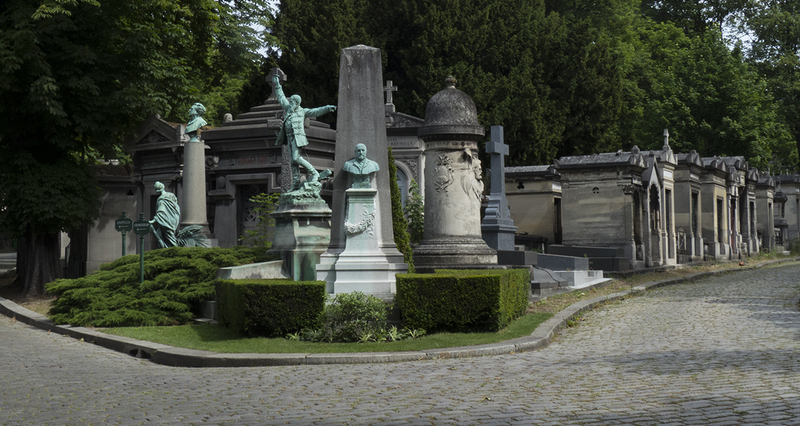 The first stop would be the Père Lachaise Cemetery. Buried here are many notable figures from the worlds of literature, theatre and music. Included in this star studded line up are Jim Morrison, Oscar Wilde, Sarah Bernhardt, Édith Piaf, Gertrude Stein and a bunch more you probably wouldn’t recognize any way. All were cremated and placed in above ground tombs. The sizeable row upon row of vaults, over 2000 in all, created a city of dead dating back over the past 200 years. From there, we once again boarded the Métro bound for a destination of Jared’s choice, the Musée de la Musique. 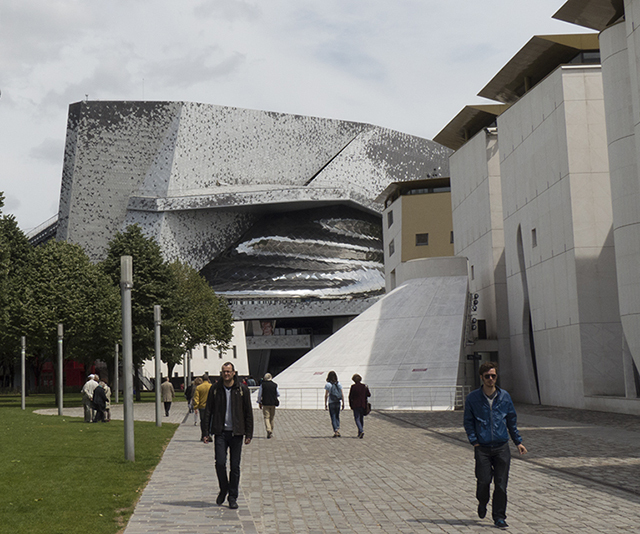 Situated on the grounds of the Philharmonie de Paris, this impressive collection included a 11.5 foot string bass called an Octobass of which there are only two in the world. It takes a ladder to play. No wonder it never really caught on. 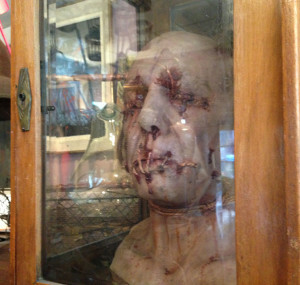 Jared saw the other one at Musical Instrument Museum in Phoenix AZ. 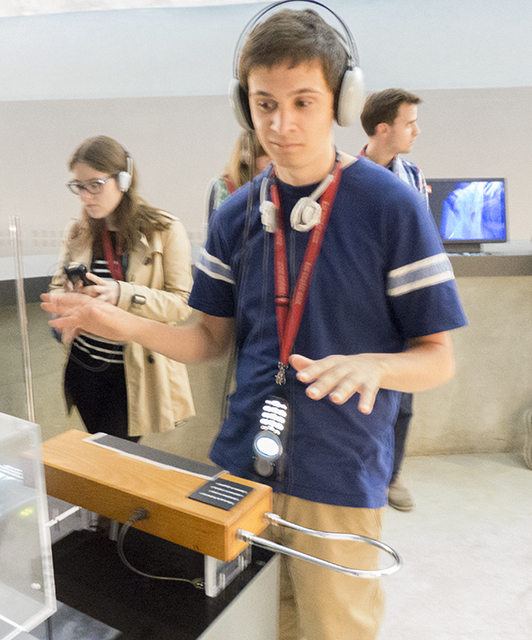 They also had a Theremin, which is an early electronic musical instrument controlled without physical contact by the performer, which Jared attempted to play. The sound is very eerie like something from an old sci-fi movie. We woke up on Saturday and attempted on yet another subway excursion to try our luck at the Paris Flea Market at Clignacourt. The sizeable market, which is only open Saturday thru Monday, boasts some 2500 venders. This would surely be more than enough to keep us busy for a few hours. There were row upon row of petite stalls and miniature shops actually divided into 15 separate markets, each with their own specialty. Some of the market’s specialties included new cloths, large vintage furniture, bric-à-brac, jewelry, 17th century to 1970’s antiquities, graphic arts, old advertising, vintage and antique textiles, strange oddities and so much more. It was overwhelming and exhilarating all at once. We didn’t buy much but it’s not always the purchase but the hunt that makes flea marketing so much fun. We had planned to go to Giverny, Monet’s Garden, after lunch, but when we arrived at the train station, we discovered the next train was still an hour away and with the 45 minute train ride and the 45 minute walk to the site, we decided to hold off for that escapade till tomorrow. As Jared once again shepherded us on another 4-mile trek we meandered our way along the various shopping districts and along cobblestone streets towards the ever-present Eiffel tower. 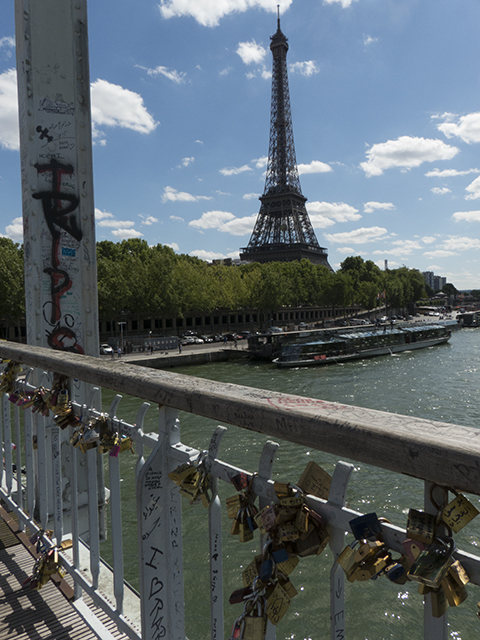 We crossed over one of the bridges lined with “love locks.” You sign your name upon the padlock, secure it to the railing and toss the key into the Seine. Apparently its a bit of a environmental issue but continues to be a draw for tourist wishing to show their undying love for one another. 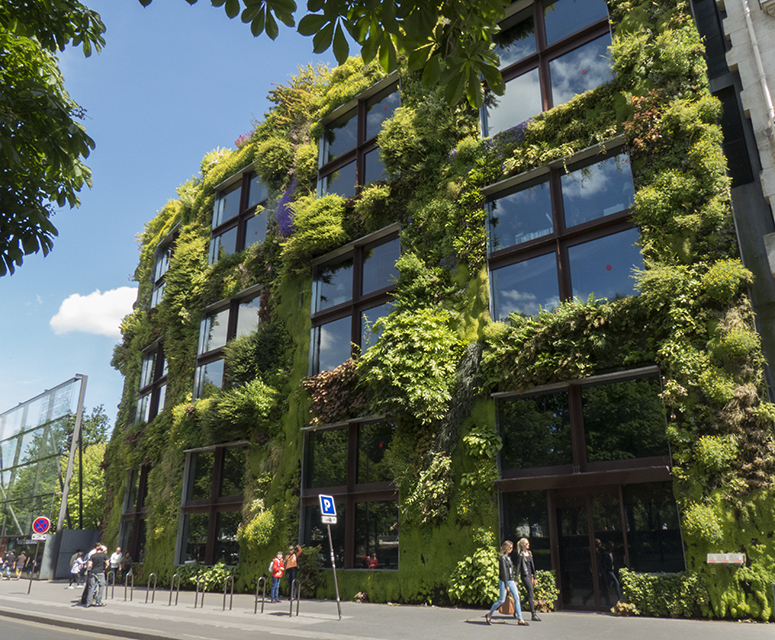 Along the way, we stumbled upon a most unusual building whose whole front was covered with plants. I mean literally covered. The building was alive! This was the epitome of green construction. We finally arrived back at the hotel and decided to see what was Anthony Bourdain’s take on Paris. An episode of Layover Paris, inspired us to try our hand at ordering some real French Bistro cuisine for our evening meal. Back to the Métro and onto the district called Montparnasse. Under the shadow of Paris’ only skyscraper, we found a considerable variety of affordable restaurants. 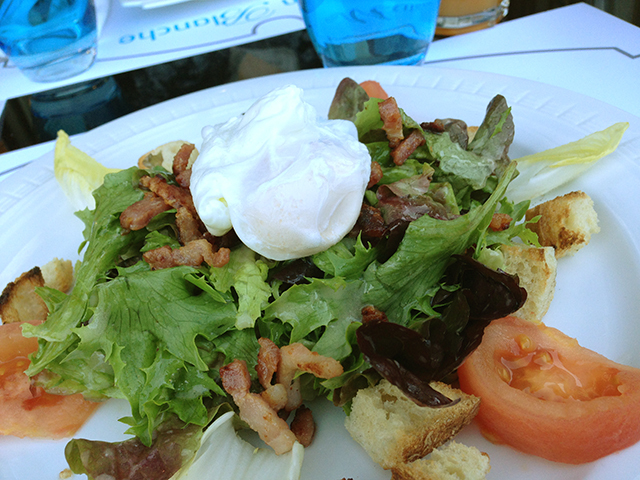 Although many were quintessential Crêperies, we succeeded finding a endearing little bistro, with a pre-fix menu. Seated at a sidewalk table, we reveled in watching the people stroll by as we ate. The waiter was quite sympathetic as we stumbled through the menu with our IPhones tuned to Google Translate. His English turned out to be as good or bad as our French. When we inquired what the Plate de Jour (plate of the day) was and he pointed to his upper arm. We stared at him not having a clue as what he was referring to with that gesture. He also withdrew his IPhone, typed something into Google Translate, and showed us his result, BIB. Even more confused we all started to laugh. As we continued to decipher the menu, the waiter returned once again with the word Flank written on his pad. Now we were getting somewhere. 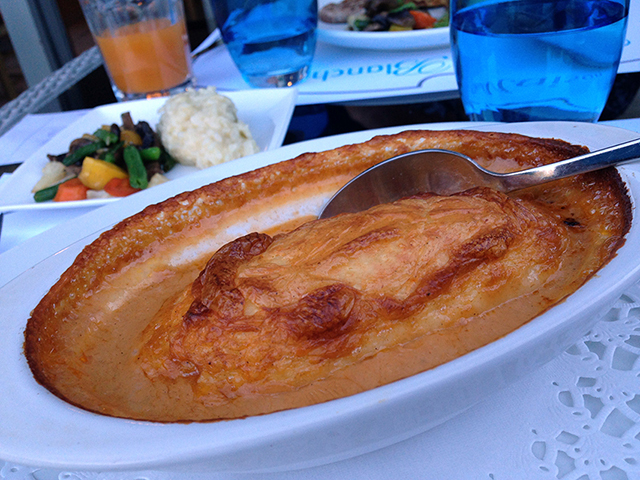 Jared ordered the Plate de Jour, French onion soup and for dessert a croustad aux pommes a L’Armagnac maison. This turned out to be an apple turnover doused in liquor. Good thing the drinking age is 16. I decided upon marchons de carnard donfits aux pommes sarladaises or roughly translated, pieces of duck with roasted potato slices. When it came to my dessert, I ordered fromage blanc aux prueaux d’Agen. I thought I was ordering a cheese plate but what arrived was a yogurt like custard with a rich prune sauce in the center. It was very bland tasting till we notice the waiter had brought over a small jar of sugar earlier. Jared suggested it was for my dessert and low an behold it made a world of difference. 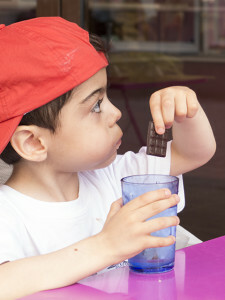 When the waiter returned I confirmed that was what the purpose of sugar. He was amused and laughed at our discovery. We departed the Bistro, full and pleased with our first try at Bistro food, some fresh bread, fruit and cheese for a later snack and headed back to our hotel. Pardon the double post but I’m getting a little backed up with so much to see. 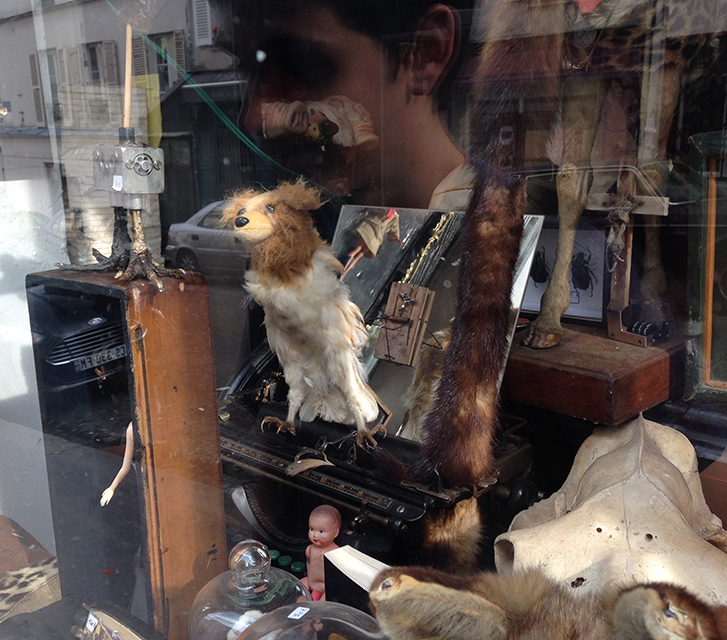 We awoke up to cloudy skies and a chance of rain so promptly departed our lodgings in search of the Porte de Vanves flea market. This rambling barrage of tables circled a few blocks and was just a short, leisurely walk from our hotel. We spent a couple hours, rummaging through boxes and picking over tables laden with everything from junk to treasure. Acquiring a few trinkets, we headed back to the hotel for a little R&R before dinner. Tonight we decided, we would to try one of the many Crêperies we had encountered on our restaurant search the previous night. Jared ordered a crêpe filled with Cheddar cheese, egg and bacon. I had one stuffed with bacon, goat cheese and tomato. 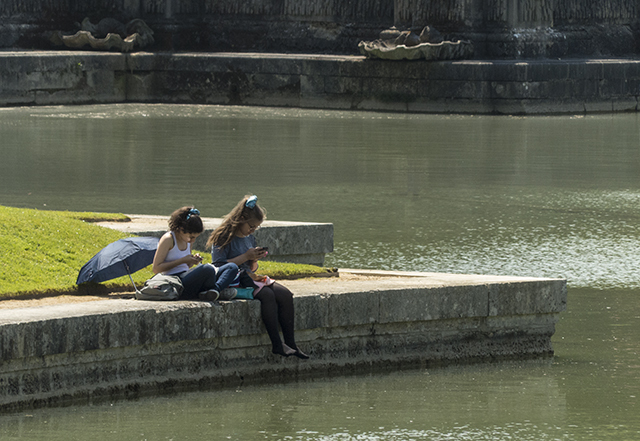 We really need a Crêperie in Pond Eddy! 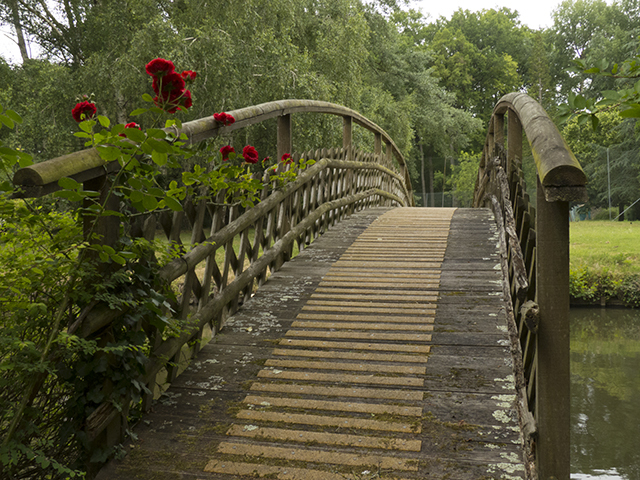 The trip to Giverny would prove to be one of the highlights of our tour. 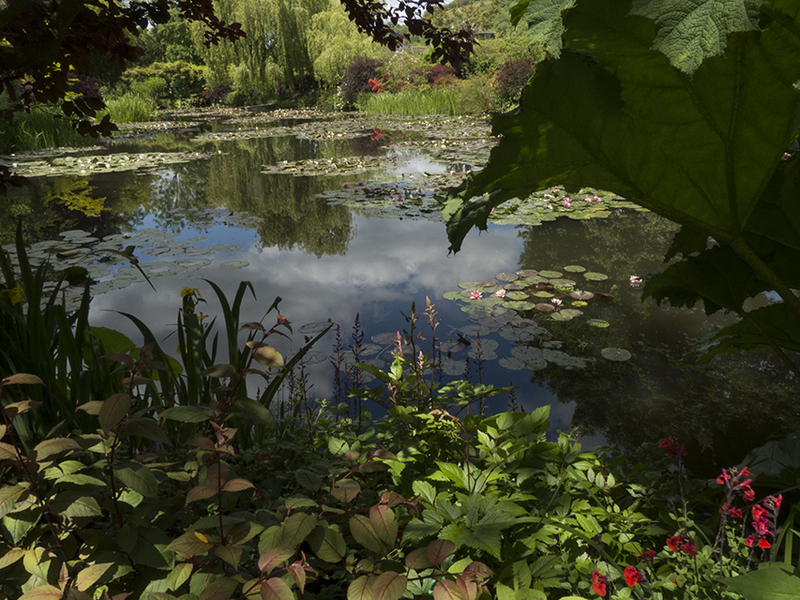 Giverny was the home to Monet and the inspiration of many of his exquisite paintings. We had purchased our ticket the night before so as to not be so rushed in the morning. The trip involved a 45-minute train voyage to Vernon then either a shuttle or a long, 3-mile walk, not the 1 mile I had read in a post. 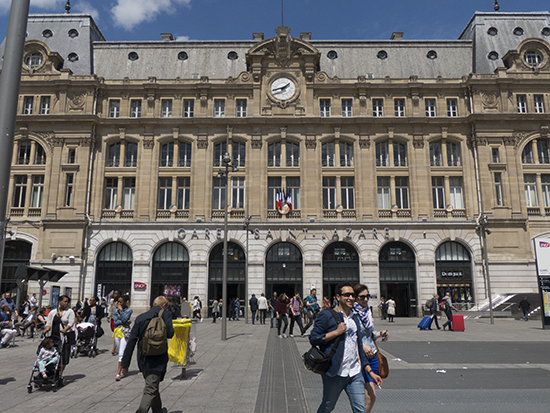 It was fortunate we arrived at the Saint-Lazare station early with ticket in hand since only one train car had the revered second level. We traversed the countryside backwards but with eyes wide open, peering out the oversized window. The train rumbled along the Seine most of the way so our elevated view was gorgeous. 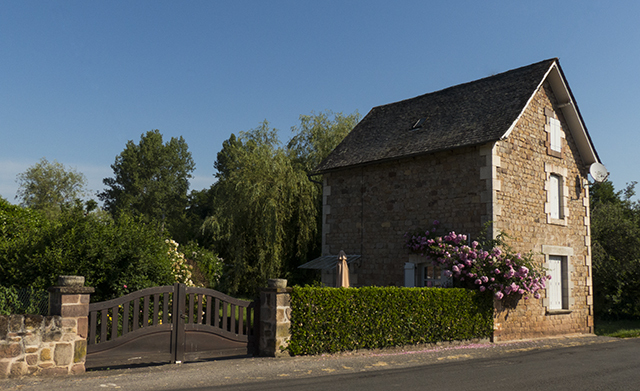 We passed by quaint villages, rich farmland, countless small but productive gardens and even a French manor or two. 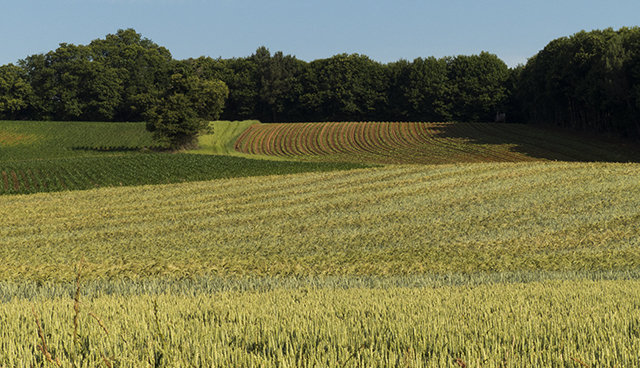 This taste of the countryside excited us about the upcoming second leg of our journey into the rural France. When we arrived at Vernon Station, there was once again another the line, this time for the shuttle to the Giverny which was another 1.5 miles away. To our delight and appreciation, the restaurant on the corner offered bike rentals. Yeah, no walking! 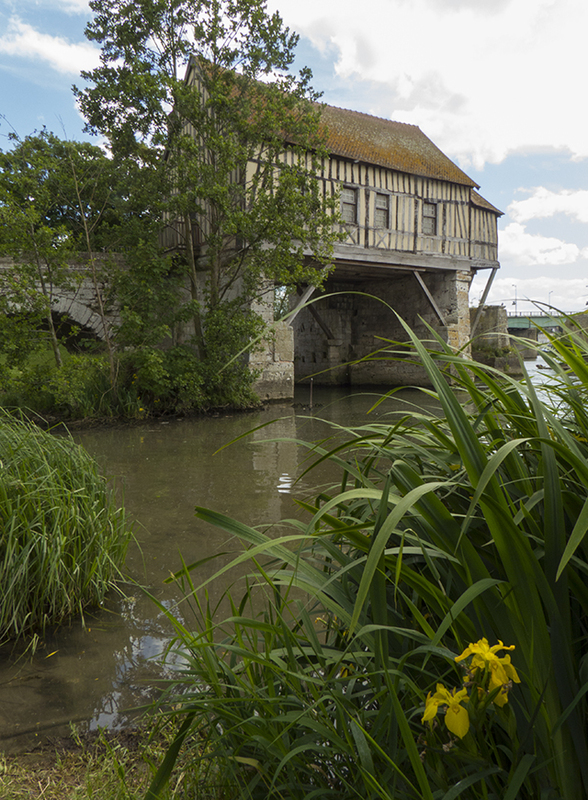 We snapped up two of the well-worn vehicles and peddled along the level and scenic bike path towards Monet’s Garden. Giverny was a little village in itself so we stopped for a quick bite at one of the take-away shops. I had the finest potato au gratin I’ve ever eaten. America could really do with some fast food like the snack we had just partaken. 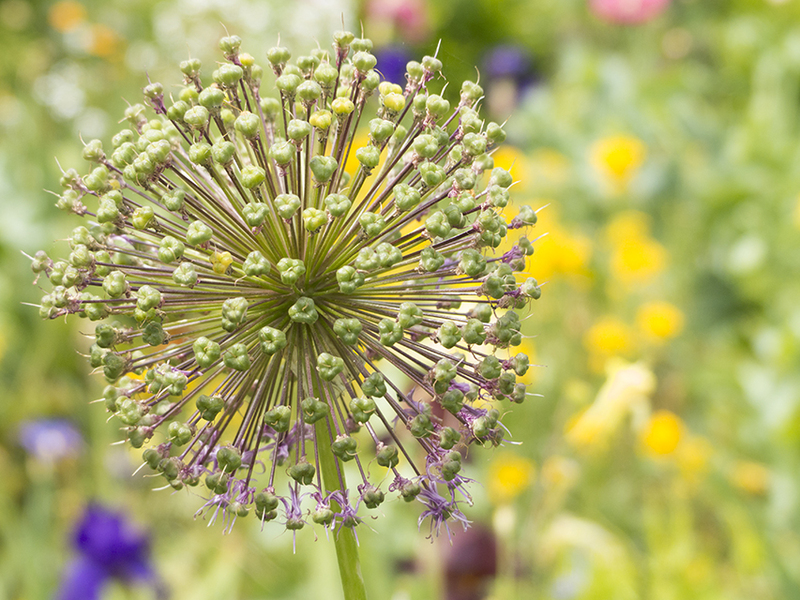 The gardens were astonishing; every inch was lined with a rainbow of various rich and seductive colors. Flowers of every variety dotted and lined the paths. 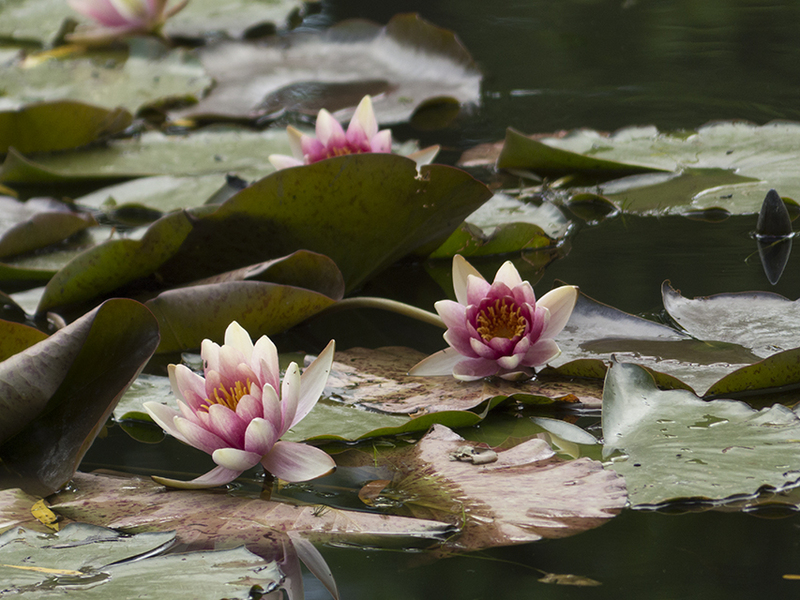 My favorite section was the lily pond, immortalized by Monet’s watercolors. I took so many pictures that I made a separate photo gallery for you to enjoy. After the garden tour, we leisurely made our way back to Vernon exploring the tranquil village till our return train arrived. For our last night in paris we would once again like to thank Anthony Bourdain for directing us to some outstanding street food. 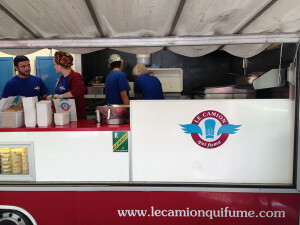 Forget the posh napkins, tablecloths and seating, the Camion Qui Fume is Paris’s first American-style burger truck, run by Californian Kristin Frederick. The truck pumps out about 500 gourmet burgers a day often to long lines. The succulent burgers were mouth watering and the fries, hand-cut and perfectly cooked. Jared ordered the burger de jour with provolone cheese, mushrooms, tomato and ketchup. I got the classical with cheddar, lettuce, onions, pickles, tomato and mayo. We merely had to check the website for the days location. We then devoured our feast on the steps of this classic piece of architecture and watched as a mounted guard, with band in tow, paraded past. So this morning we procured our tiny car, which would be much better for the back road travels we anticipated, and headed out of town. We wanted to towards the French Alps instead of spending four day in Lyon. It also tuned out the hotel I had picked for Lyon was 30 minutes out of town in a kind of sleazy part of town. 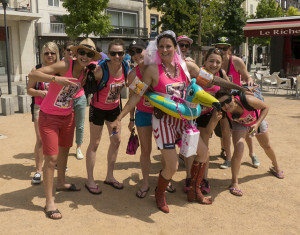 We had seen enough of city life anyway and were anxious to experience the rural French countryside. So we changed our plans around and hopped on the toll road, which is much quicker but quite pricy. We had a bit of trouble figuring out the toll system, ended up in the wrong lane and had to back out once. The toll for about 100 miles was 28 Euro. Ouch! But the food at the rest stops was pretty tasty. 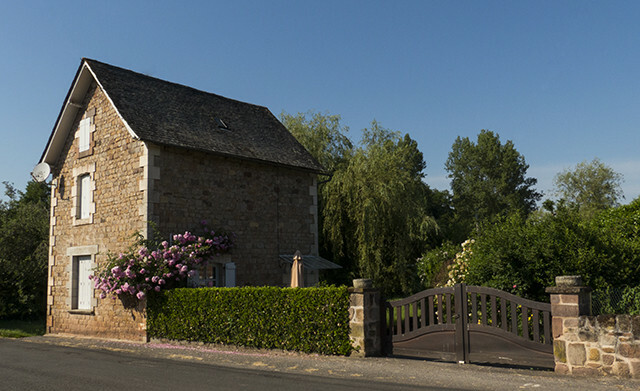 Our evening would be spent a small hotel called the La Maison Blanc located in the small village of Romanèche­-Thorins. The town boast rolling vineyards, and a windmill dating back to 1813. We treated our self to a hotel swimming pool as the weather was getting quite warm. The hotel was old but the restaurant was amazing, with outdoor seating over looking the pristine blue pool. It has been our best meal so far. 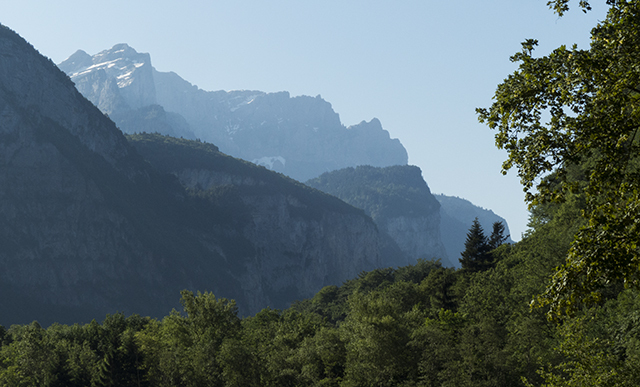 The next leg of our journey would take us to the village of Annecy, our base camp for the French Alps. This would be our home for the next two days as we explored the area and made our way to Chamonix. 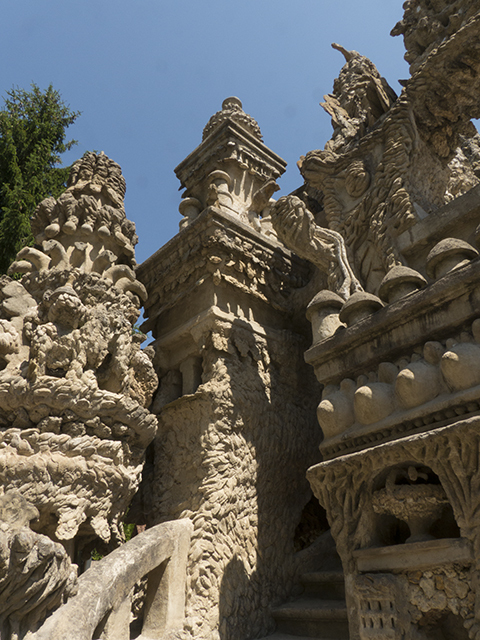 Before arriving in Annecy, we took a side trip south to something I had discovered on the Internet, Le Palais Idéal de Ferdinand Cheval. 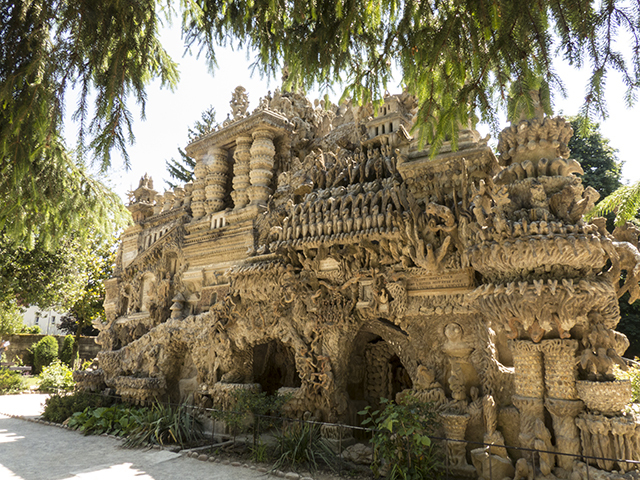 In 1879, the Postman Cheval began this strange endeavor in his garden from the odd stones he stumbled upon during his daily rounds. 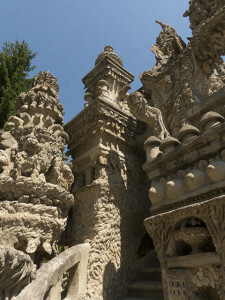 To augment the stones, he used various shells including snails and oysters, all assembled with lime mortar. to Hautervies and resumed our three-hour journey to Annecy. 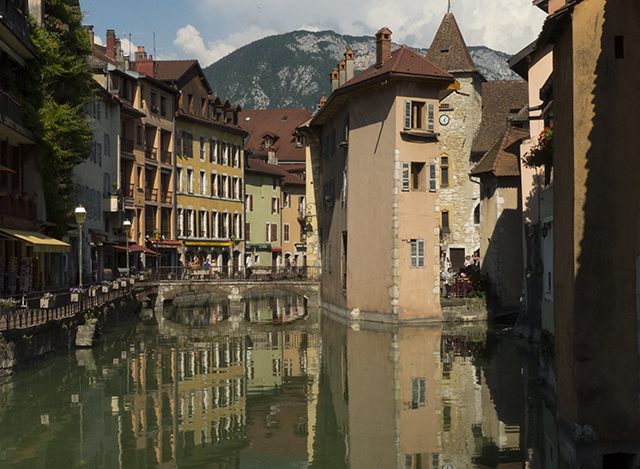 Annecy is located at the base of the Alps on the shores of Lake Annecy. 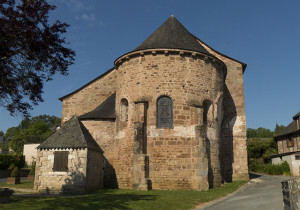 This medieval village is a prime tourist town with lots of shops and marvelous food and quaint accommodations. Our hotel, should I say motel was not in that league. It was 10 minutes out of town and though clean, the smallest room I had ever stayed the night. The bed barely in fit the cramped courters and the bathroom, with the shower, were no larger than a closet. The weather was in the 90’s and our hotel did not provide any AC. We quickly headed for Annecy for an afternoon of food and photography, not wanting to return to our room till the night air had cooled it a little. 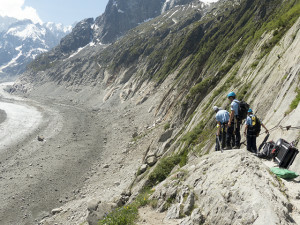 Tomorrow morning we would travel to Chamonix. 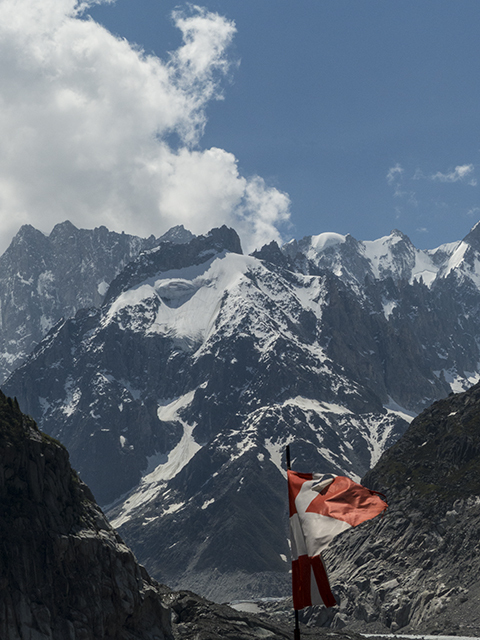 We woke early for our short trek to Chamonix, the site of the first winter Olympics in 1924. 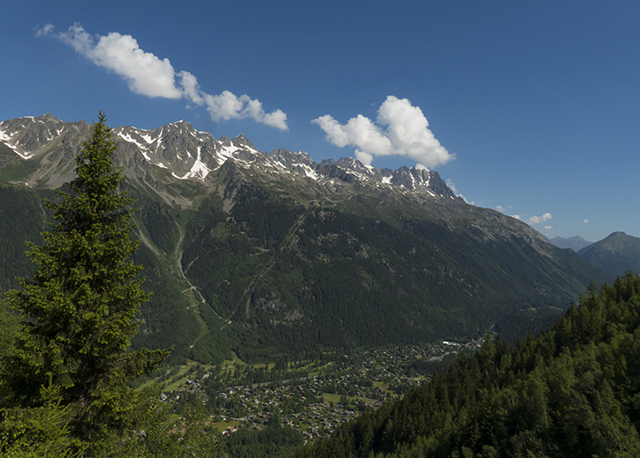 The striking mountain scenery that lined the road to Chamonix was breathtaking. I could hardly believe Jared and I were in the French Alps. This leg of our adventure took a little over an hour, and as we approach the town the Alps towered in the background. Some were still topped with a coating of snow despite the 90+ degree temperature at the base. 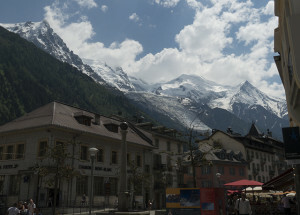 We had planned to take a tram to the top of Mont Blanc but when we arrived we found it didn’t open for another week. 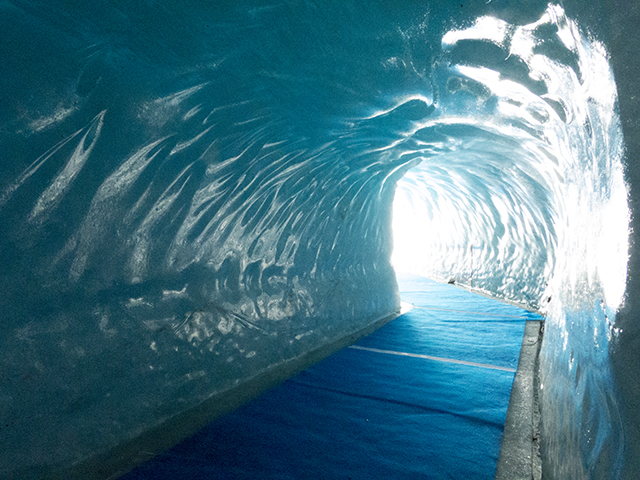 We were directed to a train ride up the mountain to see the Glacier and visit an ice cave carved into the glacier. The small gauge train slowly winded its way up the steep grade till we were deposited at our station. There would be the option of a tram half way to the glacier or a walk along a craggy path. We opted for walking down and then taking the tram back up. The path we took also led to a popular climbing wall, a smooth shear face dotted with climbers. To our dismay, moments before, a climber had fallen 500 feet to the rocky ground below. We watched at the rescue crews arrived and a helicopter came to take them away. We never heard any thing about it on the news but prayed for a safe recovery. Once we arrive at the tram’s let off point, there was still a 500 step climb down to the ice cave. 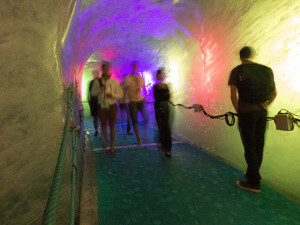 The cave was lit with colored light and provided a cooling respite rom the hot summer heat. I stupidly managed to drop my bankcard some where along the way and had to struggle with the phone system to have it canceled. All is good, thank goodness we still had Jared’s resources. Ok, I thought last nights room was small but this one was even smaller. 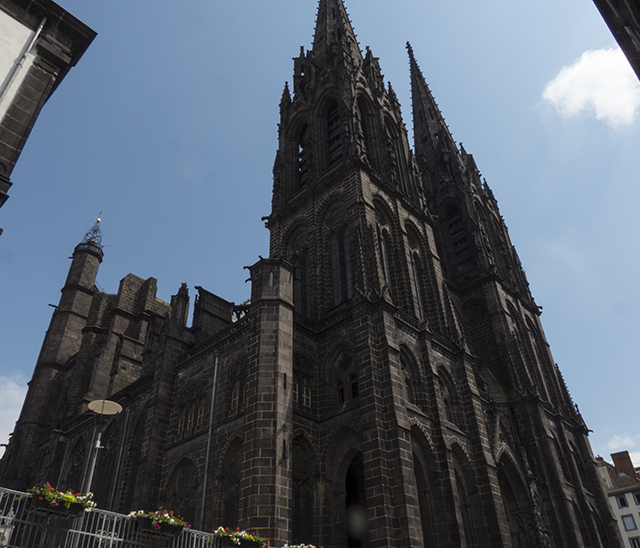 We chose the town of Clermont-Ferrand as a halfway point for our travel to the Bordeaux region of France. It would just be a short stop over so we quickly departed our cramped quarters and headed for the center of town to play tourist. There was live street music every where. We stopped for a cold beer and watched the people stroll by. In the town square, we met a bride-to-be doing some kind of traditional money collection scheme. So cute! As we feasted on yet more on ice cream, this little boy joined us in the shade. We walked around the winding streets and settled on a great little restaurant on a cobblestone side street. Jared had his first cheese Fondue and loved it. The meal was excellent and we headed back to the hotel for a good night rest. 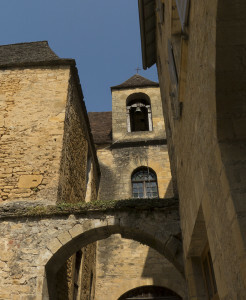 Tomorrow we would be staying in a well deserved, semi-luxury hotel, in the medieval town of Sarlat-la-Canéda. 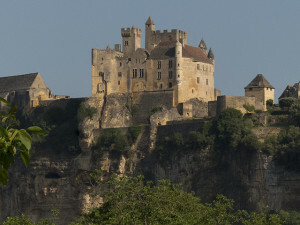 We arrived Sarlat-la-Canéda and finally we had some exceptional accommodations for the next two days. There was a lovely swimming pool, a TWO room suit and bath room bigger than our last two hotels rooms. 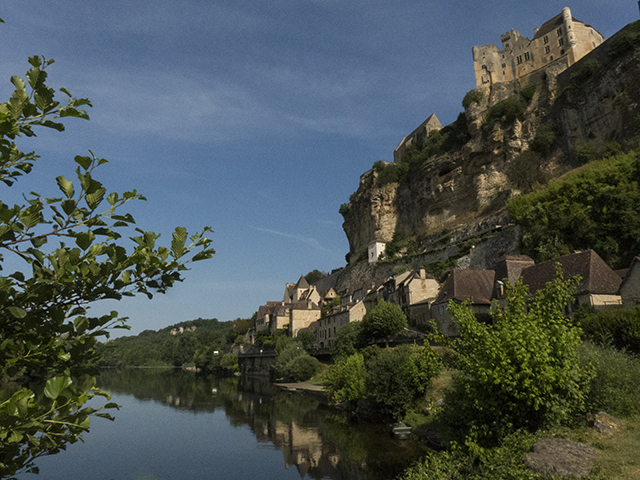 We were just a 10-minute walk from the center of this remarkable, medieval village. We excitedly wandered the twisting streets, with me taking hundreds of pictures. It was Sunday afternoon so most the shops were closed and the streets were fortunately very quiet. We wandered through narrow alleyways and into ancient courtyards. Much of the early architecture was preserved and it felt as if we had stepped back in time to a era of knights and dragons. I though Jared would ditch me for all the pictures I found myself taking. 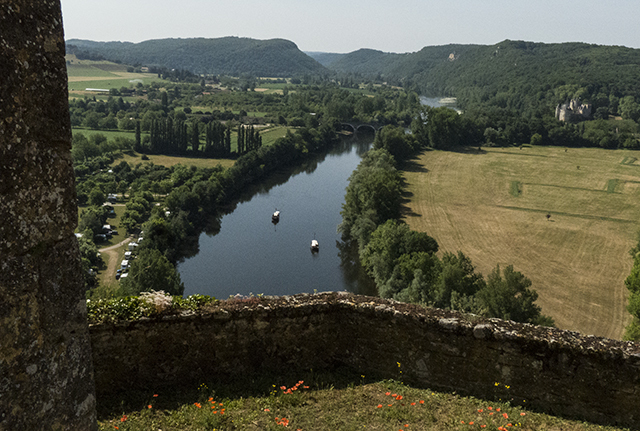 There is a whole photo gallery devoted to the astonishing little town for you to enjoy. 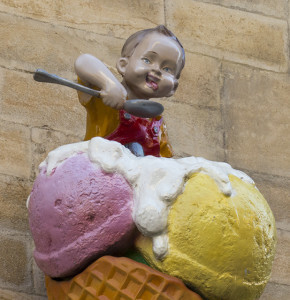 We returned to the hotel for a swim then headed back for an evening meal and, of course, more crème glacée (ice cream)! Today’s escapade included a trip to the Château de Beynac, a massive castle perched atop the golden cliffs of the Dordogne River. We decided to skip the guided tour and thoroughly explored each of the great halls, high towers and courtyards on our own. Arriving right when they opened, we had the place practically to our self. Some of the yellow limestone walls opened onto bedrooms with private toilets, well really just a small room with a hole in the floor. Other rooms looked to be great banquet halls. I could imagine the countless guest that had entered and dined in these vast spaces. We climbed massive stone stairways and peaked over ancient parapets. Jared really enjoyed the ancient weaponry display in one of the main halls. 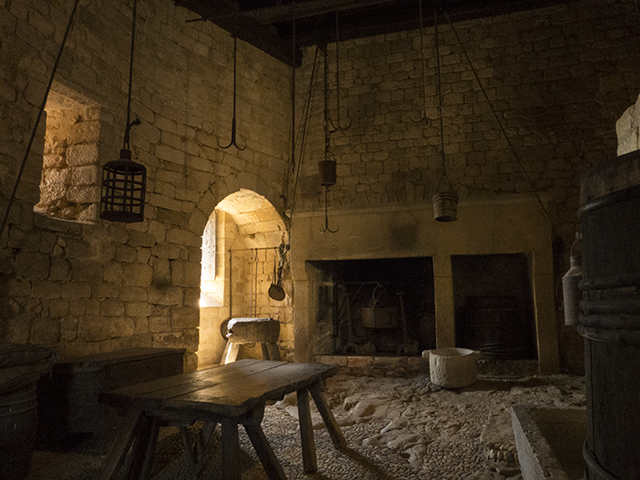 There was, what looked like, an immense kitchen with hooks hanging from the lofty ceiling for meats and a giant hearth for cooking. Wine barrels lined one of the walls and a heavily used cutting block poked out of a corner. 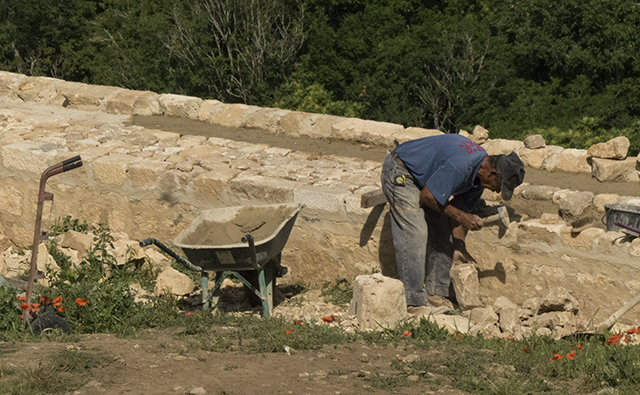 A restoration project was in progress with men fixing roofs and cutting new stones for a battered wall. The sign stated its start in 1990. By noon, the castle was quickly filling with bus loads of tourist. 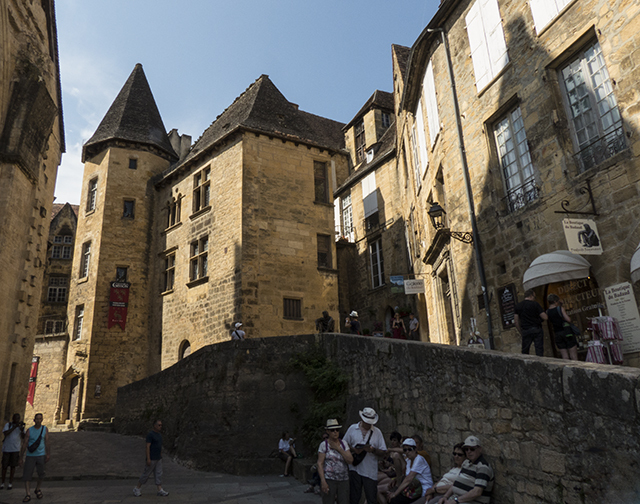 We bid a fond goodbye to the marvelous castle and headed back to Sarlat-la-Canéda for another afternoon of exploring and eating our way through the village. There are many more pictures in the Photo Gallery. 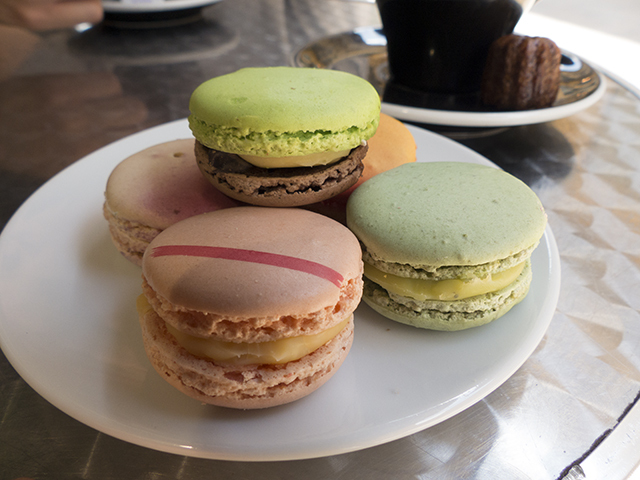 After a quick break we head back once more to the village for a treat of Café au lait and macaroons. What a day, very difficult and yet still very rewarding. 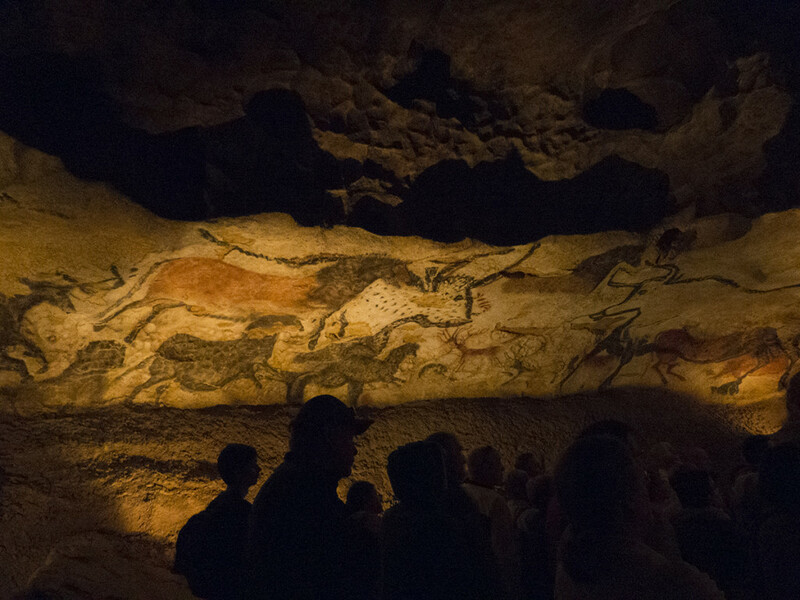 We left Sarlat-la-Canéda early and made plans to visit the prehistoric cave painting of Lascaux. 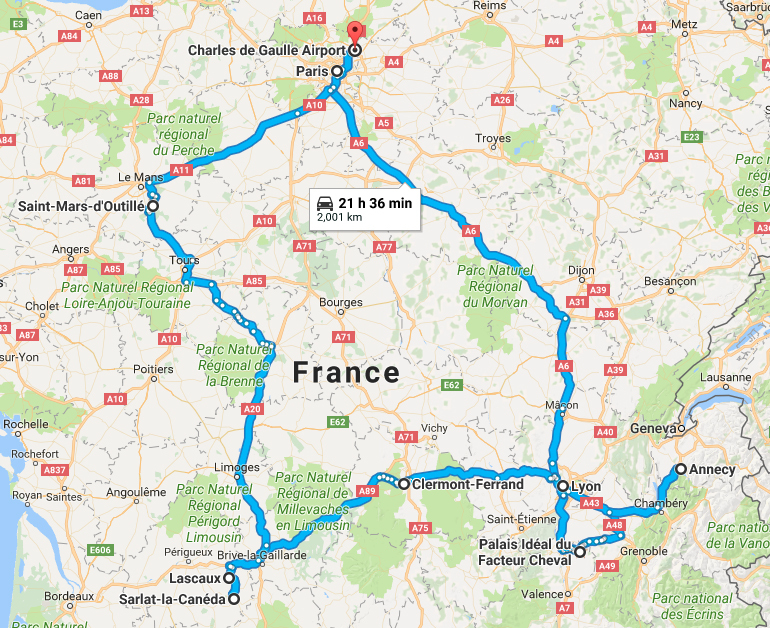 Our French cell package had expired the previous night so we decided to use the car’s GPS in lieu of renewing the service. I had forgotten to get the exact address of site so set the GPS for Lascaux city center. Two hours later, along extremely narrow and winding roads, we arrived in what the tiny signpost announced was Lascaux. We quickly realized this tiny hamlet, with no sizable village in site, was not where we were supposed to be. A moment of panic seized us as we stopped at the next crossroads and to our relief, found an older gentleman working in his garden. He kindly tried to help us set our GPS for the correct coordinates but his spelling was bad and the communication barrier was proving to be far too great a challenge. A few minutes later, a farm tractor drove by and the kind man called him over to aid us. He was able to give us the correct spelling of the town we needed to be in, but when we tried to plug it into our GPS, it declared we were 14 hours away. Unfortunately the GPS was trying to send us to the wrong Montignac. We weren’t quite sure what to do now. As we continued to fight with the car’s guidance system, the gardener, seeing we weren’t leaving yet, knocked on our window and told us to wait a few minutes. We weren’t quite sure why but then, to our delight, the tractor driver returned with a map! I thank the kindness of strangers and will pay this effort forward at the first chance I can. We ended up back tracking the winding roads to the site of the duplicate cave. An hour later, we finally arrived at our intended destination, Lascaux II. We remained in good cheer since the drive was through the beautiful French countryside. I had stopped numerous times along the way to take more photographs. The original site was discovered in 1940 and closed to the public in 1965 due to the damage being unknowingly done by visitors. They brought in pollen and algae which attached it self to the walls and CO2 which began to discolor the images. 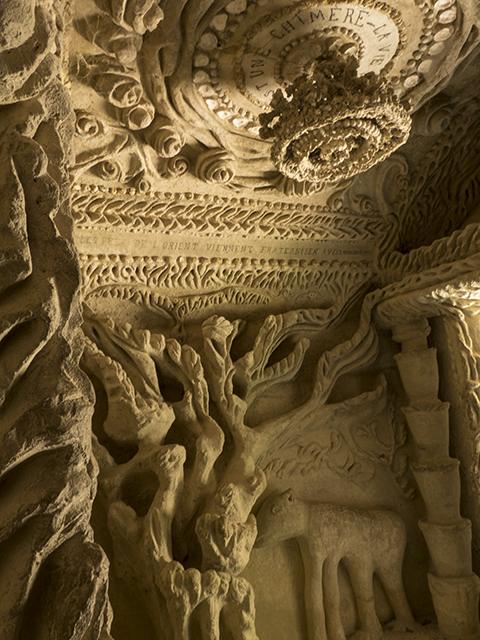 The entire cave was duplicated so that visitors could enjoy these specular images. Even Picasso, when he viewed the originals in 1950, declared he had met his master. The new installment, 200 meters from the original site, opened in 1983. 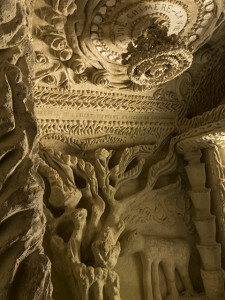 Lascaux II is an exact replication of the original site within a 5mm tolerance. The cave is as close to every curve and surface of the original cave as possible. 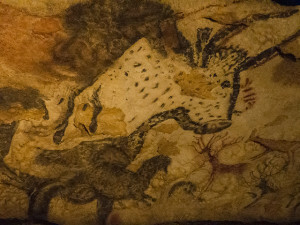 The 17000 year old paintings were meticulously reproduced using the same techniques and materials used so long ago. I am so delighted we had found our way back to our intended destination instead skipping it because of time retraints. Our evening’s lodgings were to be 4.5 hours away at the Kadampa Meditation Center-France in the town of Saint-Mars-d’Outillé. I was eagerly looking forward to visiting this sister center to my own World Peace Temple in Glen Spey. 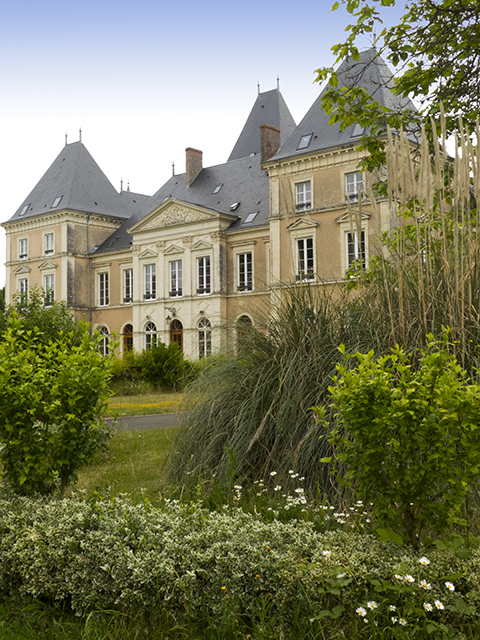 We had booked two dorm rooms and would spend the next day roaming the large estate before returning to Paris. Without a working phone, I tried to email the center to let them know we were going to be very late, six hours to be exact. As we drove the long journey, with the help or hindrance of our GPS, we encountered a completely closed off portion of the highway. There was no indication of how we were to navigate the unexpected detour. Thankfully, Jared worked it out and we were once again we were back on track. As the drove along the back roads waiting to find the next major highway, our gas tank continued to make its way to empty. We must have driven 100 miles without ever seeing a single gas station and I was beginning to get a little more than nervous. The first gas station the GPS said we would encounter woefully never appeared. I was not feeling too confident the second was going to be where it was supposed to be either and our tank was now reading 1/8 full. To our relief, the second station was where it was supposed to be and not a minute too soon. Once we made it onto the toll road, upon exiting, we couldn’t get the toll machine to accept our only credit card. We scraped every last Euro to pay the first toll. At the second toll station, after the machine rejected our card again, it spit out the ticket so forcefully it popped out of the machine. It began to blow away so I quickly jumped out of the car and chased it down, much to the dismay of the driver behind me. By the time we finally reached the center, it was already 9pm. Lucky for us, the sun doesn’t set here till 9:30! Maneuvering in the dark would have been a lot more unnerving. Upon our arrival, the place looked all locked up. As we walked to the side and peered through the fence we saw a single young women dashing to another building. Our unexpected greeting momentarily startled her but thankfully she understood English. Sophie was her name and I gave her the biggest hug when she opened the door. She retrieved someone in charge and helped us to our rooms. I was never so thankful as then for my worldwide Kadampa family, so eager to make us feel at home. We woke to a cloudy, about to rain any time, kind of day. 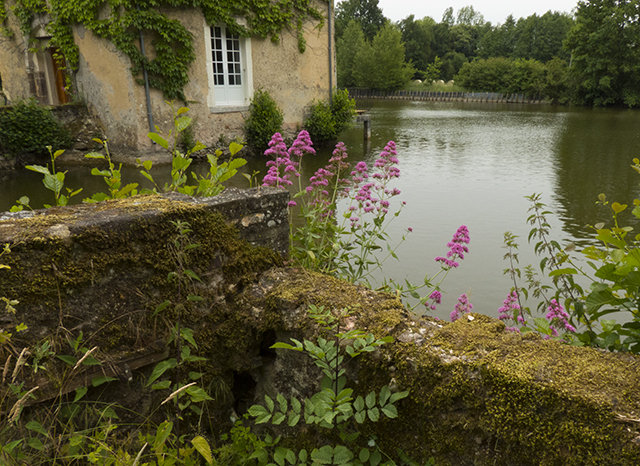 KMC France was still unbelievably beautiful even under slightly these less than perfect conditions. 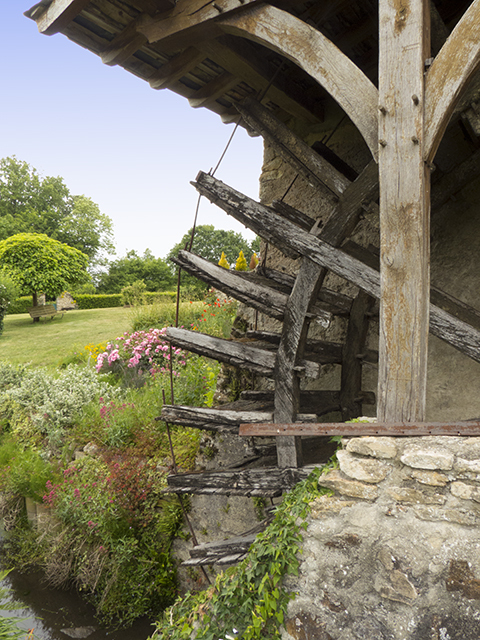 We spent the morning wandering the grounds, exploring the water wheel, winding through the gardens and peering into the ponds. Of course, I was talking oodles of pictures, most ended up in the photo gallery for you to enjoy too. We stayed for a delightful lunch then made our way back to Paris and onto a hotel nearer the airport. We were booked to fly out early the next evening. 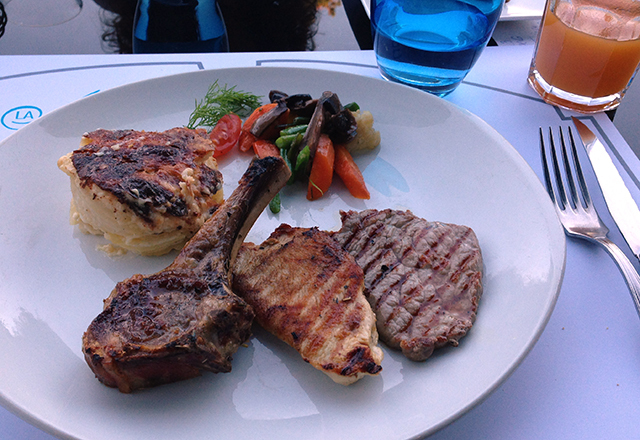 We dined in the hotel restaurant and I surprisied at the quality of the meal and the reasonalble price. I had escargot and asparagus and Jared had Salmon with fresh vegetables. For desert, of course we had dessert, Jared had lemon sorbet with a raspberry sauce and I had Crêpe Suzette. We had arrived at our fancy chain hotel near the airport the night before with the intention to spend the next day sun bathing by the pool till it was time to depart for our flight home. We had a pleasant meal at the restaurant, which wasn’t too bad. I finally go my escargot. A quick tour of the facility and we discovered the pool was actually inside so besides swimming, there wasn’t really going to be much else to do. Not even a gift shop for distraction was to be found so we head up to our room for a good night sleep. When we got up the next morning and found breakfast was 16 euro each, we decided to pack our bags, checked out of the hotel and spend our last day in France at the Palace of Versailles. 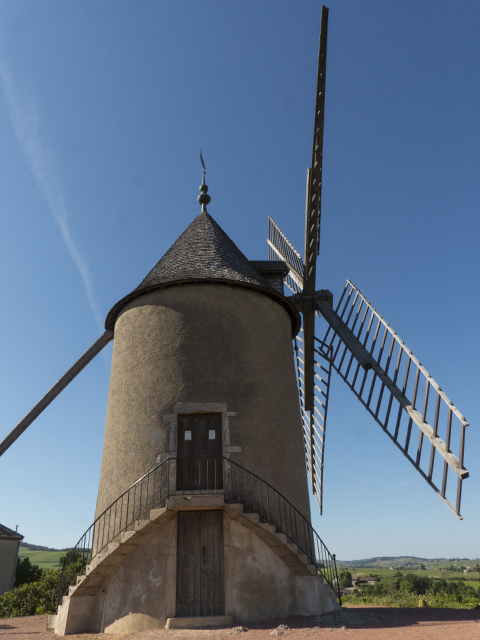 We had it penciled in on our original list of things to see in France but never found the time to squeeze it into our schedule till now. 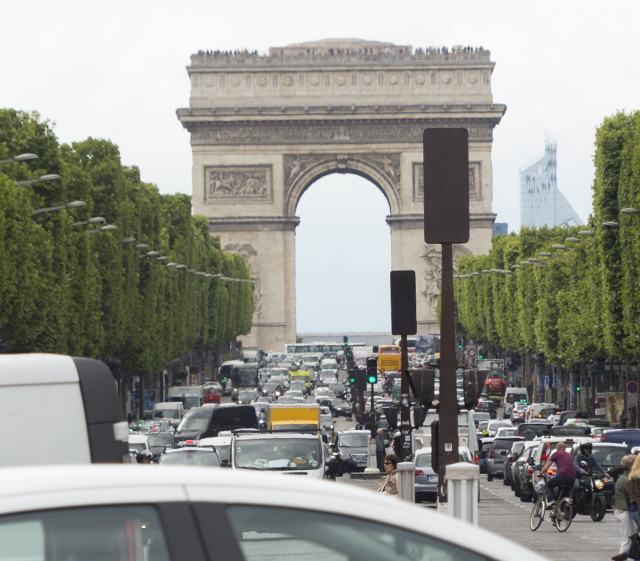 The what should have been an hour long trek to the east side of Paris took nearly two hours with traffic. Jared and I had an audio book to finish so we didn’t mind the bumper-to-bumper snail’s pace as we made our way along the highway. We had cash for the tolls this time! The Château de Versailles was the center of political power in France from 1682, when Louis XIV and Marie-Antoinette moved from Paris, until the royal family was forced to return to the capital in October 1789 after the beginning of the French Revolution. As the people of Paris starved outside the walls of the Palace, the extravagant Marie-Antoinette was heard to proclaim, “let them eat cake.” This did little to improve her popularity with her subjects. 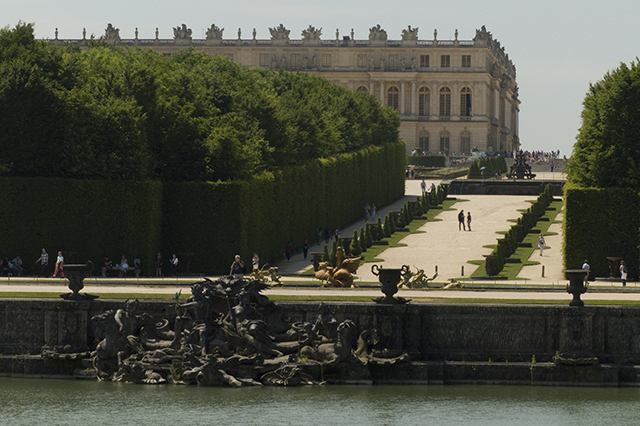 When we finally got to Versailles, we realized we should have probably departed the hotel much earlier than we had. 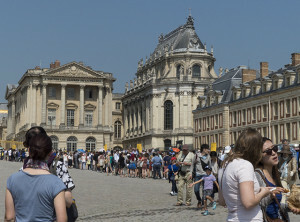 By the time we found a parking spot and strolled over to the Palace, the lines for entry were already wrapped around the courtyard. Crowds of tourists, from all over the world, were unloaded from the hundreds of busses that lined the parking lot. 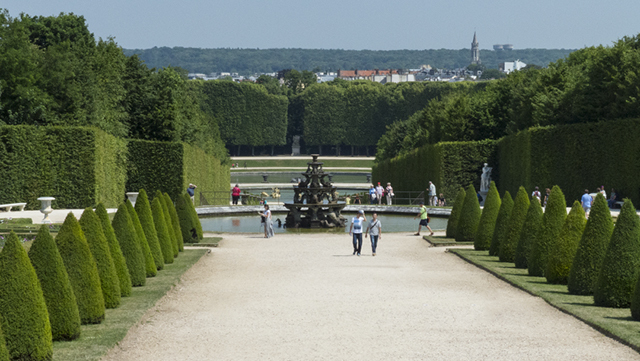 The grounds were vast and entry was free so we merrily wandered the gardens, sauntered the courtyards, strolled around the pools and watched the other tourists, and of course ate more crepes and street food until it was time to make our way to the airport. 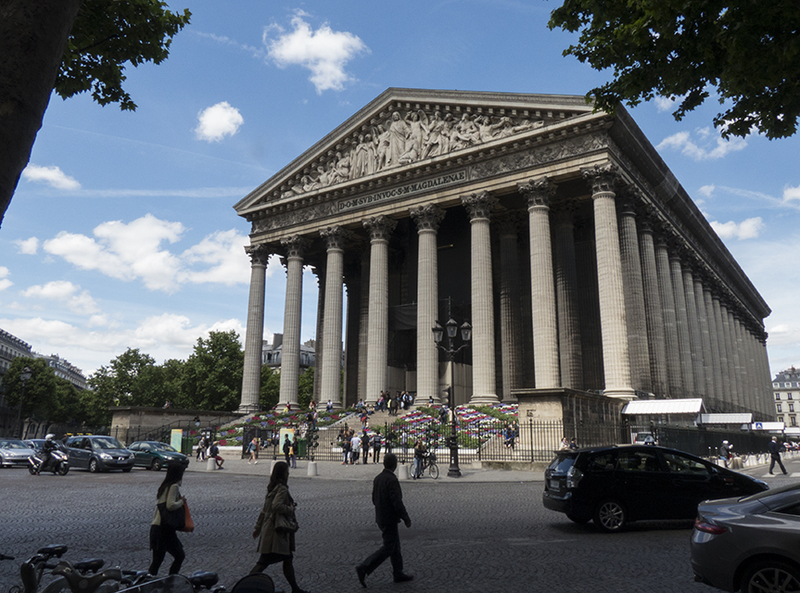 Copyright © 2019 A French Adventure. Powered by WordPress. Theme: Accelerate by ThemeGrill.